My NEW BOOK! Order today!!! 306 pages, a map, and 44 photos. If you liked my journal, you’re guaranteed to enjoy my book! 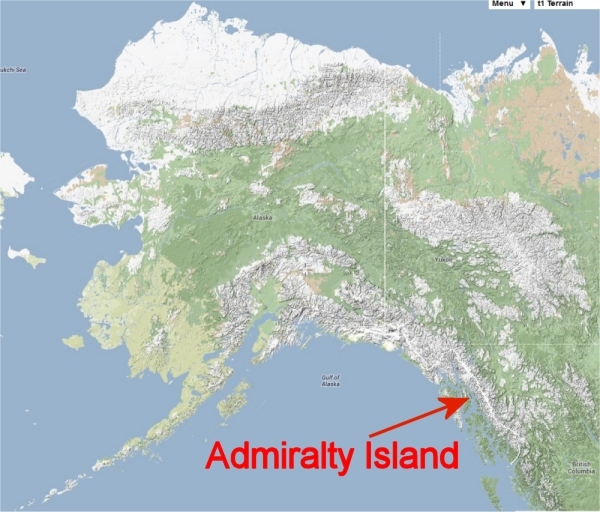 On June 30 I am leaving for a trip to Admiralty Island in Southeast Alaska. I will fly to Petersburg and then by bush plane to the Kootznoowoo Wilderness of Admiralty Island. I plan to stay out there until early September. I am not bringing any food, so my primary challenge will be to survive by berry picking and foraging other wild plants, by fishing and, when the various hunting seasons open, by hunting upland game, waterfowl, and blacktail deer. I’m doing this for the adventure and challenge. My brother Tom and I were doing “living off the land” trips in the woods of the family farm years ago when we were kids. I always wanted to do a longer, wilderness version. Why this area? Because of the many possible food sources. Admiralty Island is sometimes called “The Fortress of the Bears,” with the highest density of brown bears in North America, if not in the world. According to the Park Service there are more eagles on Admiralty than in the rest of the U.S. combined! The reason for so much wildlife is undoubtedly salmon and other food sources. The main safety concern for most people would likely be bears, but it’s far from the primary risk. The main risk will be from cold water. I will address that issue by wearing my life jacket at all times on the water and not going out of the protected bays in rough water. The next greatest risk in this temperate rain forest is likely hypothermia. For this, I’m bringing a good tent with a wood-burning stove where I can dry out, and carefully selected clothing such as fleece jackets which will keep me warm even when wet. I will also be wearing good rain gear, of course. 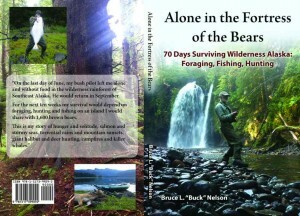 As for bears, I won’t camp where they are concentrated, like along salmon streams. For the first time I will have an electric bear fence. Not to protect me, but to protect my camp when I’m out foraging. Lastly, I will have a shotgun and rifle for hunting which I would use for bear protection only if absolutely necessary. Although this is the Alaska wilderness I will be on the coast 99% of the time. There should be places where I can get data coverage and if so I will be posting occasional updates on my journal. I will be solar charging electronics on sunny days. In case of of no coverage or electronics failure I’d be able to wave down a boat sooner or later in case of emergency. My main transportation will by an inflatable kayak. Because I’ll be based at a series of fixed base camps I will have much more gear than usual, such as a lightweight cot to keep me off the wet ground. Rather than one fishing rod I’ll have three: a fly rod, a light spinning rod, and a heavy spinning rod for salmon and for ocean fishing for halibut. I’m bringing a crab pot. One issue is the “boom and bust” that tends to be part of hunting and gathering. Alaska natives largely relied on smoking and drying of salmon for lean times. Drying fish would be a big issue for me because I’d have no one to leave at camp to protect the drying fish from bears and ravens. To address the issue I’ve elected to bring a pressure canner and jars. When I have good berry gathering I’ll can up a bunch for when the berries are gone. When the fishing is good I’ll can a batch for when the fishing is bad or the sea is rough. I plan to bag one blacktail. When I do, I’ll save as much meat as I can eat fresh and can the rest. The jars will be packed in plastic boxes and suspended far off the ground. The biggest challenges for me will likely be the monotony of certain foods and an unfamiliar ecosystem. The coast of Southeast Alaska is as different form the the taiga of Fairbanks as the rainy coast of Oregon is from Montana. I have been planning and pondering and scheming for weeks. Yesterday I took a bunch of gear to the airport to ship to Petersburg. 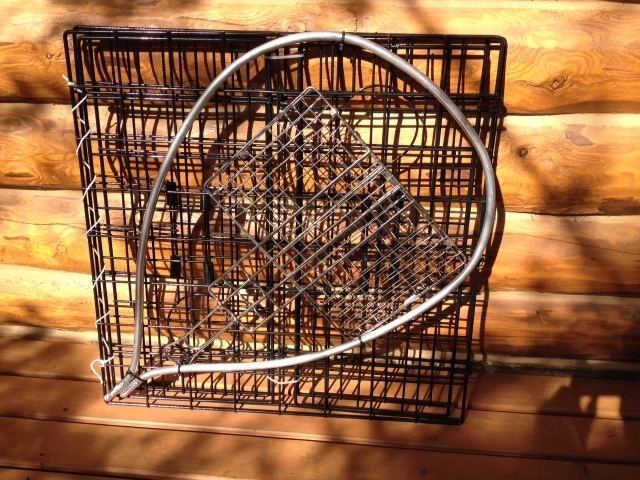 It included this contraption, which is a folded crab pot, the hoop to a landing net, and a portable grill zip-tied together for shipping. Check out my JOURNAL and GEAR LIST for this trip. Thanks for visiting! Sounds like an epic adventure. Wish you luck and warmth, have fun.